John Hargrave should be given first credit for the idea of Lone Scouts. He was serving as a Commissioner for Woodcraft and Camping in Baden-Powell's Boy Scout Movement when he wrote his first book, LONECRAFT (based on the work of the Lonecraft camps, which he started in 1912. Published in 1913, the book was intended to encourage boys who were too distant from organised scout troops to become "Lone Scouts." 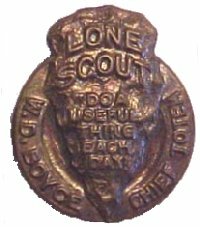 In 1915, disturbed because farm and country boys were being left out of Scouting, William D. Boyce organized the Lone Scouts of America, LSA. In the LSA a boy, by himself, could enjoy Scouting. Because of Boyce's background in publishing and given the remoteness of the LSA membership, LSA had a strong program of writing and correspondence as well as traditional Scoutcraft. In 1924, the $100,000 yearly drain on Boyce's finances became too much, so he merged the LSA with the BSA. The program continued for a period first as the Lone Scout Division (LSD) and then later as the Lone Scout Service (LSS). Eventually in the mid-1930s the program was fully integrated into the BSA and the separate LSA advancement program was discontinued. There still remains a Lone Scout (and Lone Cub Scout) program with only a few hundred members. Individuals in an area could form a "Tribe." Analogous to a patrol it had to have at least five members. If a tribe was formed and registered with LSA headquarters, the Scouts could elect a Tribe Chief. If a tribe's membership grew to fifteen or more, it was recommended that they form a "Wigwam" of two or more tribes. Mail tribes combosed of boys interested in the same hobbies were encouraged where members corresponded, due to their remoteness, through the mail. The nation was divided into twelve regions, a thirteenth taking in Alaska, Puerto Rico, Virgin Islands, and Guam. By its very nature, Lone Scout membership was very limited. When Lone Scouts of America merged with the Boy Scouts of America in 1924, it was estimated that there were 45,000 active members compared to over 750,000 Boy Scouts. Today, Lone Scouts exist as part of the Scouting Movement in several countries.